Often you see bloggers glorifying the homesteading lifestyle. 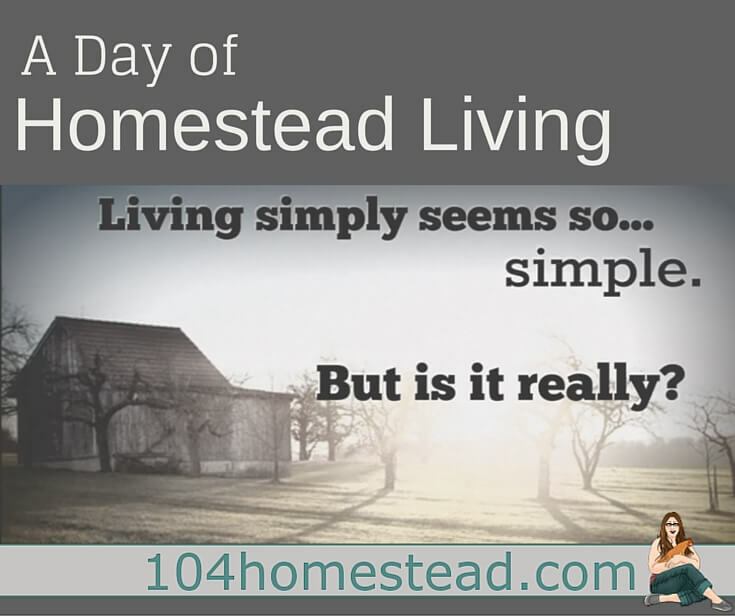 I mean… homestead living is simple living. How hard can it be to live simply? I was chatting with a few of my blogger friends. We were all frustrated and overwhelmed for a variety of homesteading reasons. One had goats go missing when her electric fence shorted. Another lost several of her crops to a freak hail storm. Another just felt like there wasn’t enough time in a day to get everything done. I can relate. Can you? As you can see, I stay pretty busy here. No, I don’t can food every day (or sneak in new chickens), but if I’m not making or preserving food, I’m outside tending the gardens that grow it. If I’m not outside caring for the adult birds, I’m inside tending the juvenile ones. Yes, this lifestyle is exhausting. You spend most of your life either anxiously waiting for the next season or feeling like you’re running behind. Is it worth it? Absolutely! No two days are the same. There is a huge sense of accomplishment whenever you finish a project. Plus, who doesn’t love the antics of chickens, ducks, and quail? I wouldn’t give this life up for anything, no matter how discouraged I may feel at times. My friends and I get how busy the life of a homesteader can be. We understand how frustrating and discouraging things can get. Maybe you can’t relate to my day, but hopefully you can relate to one of them. I am happy to share the day-to-day lives of fourteen awesome homesteaders from all walks of life. What is the biggest struggle you’ve found with homestead living? Share in the comments below. I am a little confused, why is it that you don’t have enough time? We have over an acre in garden, animals to care for, several acres of cane to plant and care for to make molasses. We cut wood for heating our home, my husband hunts and fishes, and processes all the game he kills. We also do whatever needs to be done here, a new roof, plumbing, wiring, everything! Last but not least we both work at public jobs for 40 or more hours a week, and I also do about 4 hours a month in volunteer work. I am using my phone to read your blog, because I realized years ago that no home internet and tv is the way to get a lot more accomplished. THank you for this!! I always find it hilarious when friends of mine comment on how peaceful & tranquil our life is. My one nonestop craziness in my life… the weeding!!! The weeding NEVER ends in our garden. NEVER. EVER. I actually threw in the garden trowel this year. I will harvest what I can, but I just don’t have it in me for garden maintenance this year. Could this video or YOU be ANY CUTER? Love it! So funny, but soooo true!!!!! That video was cute and it looks like you have a great little helper. Enjoyed. Jess, this is such a cute video! You’ve got a lot going on there! I kind of want to start taking my kids to the coffee shop to blog too… but I’m afraid I’d end up doing damage control more than getting work done! Does it actually work well for you? And quail eggs- that’s something I haven’t thought of yet! I loved your fast paced video. Thanks for sharing your day with your readers.